If you look at Ontario's IESO forecasting reporting/data using Google's Chrome browser, as I have, you'll be asked if you wish to translate the page from Danish. So it looks to me as the standard indicates accuracy differently than people who aren't mislead would: output of 100MW when 200MW is forecast is a 10% error if capacity is 1000MW, and a 2% error if the capacity is 5000MW. The IESO's target for an hour ahead was 4.5%; with a desire for 8000MW of wind capacity, this is close to expecting a nuclear unit at Pickering to trip off, or suddenly come back at full strength, each and every hour. The IESO also indicated forecasting accuracy had ceased improving - making me think IBM's announcement is more likely indicative of finding an "industry standard" for measuring accuracy that masks inaccuracy than one that reflects the ability to know what is about to be generated. 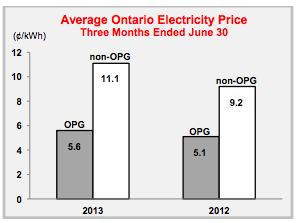 Ontario Power Generation released their 2nd quarter financials yesterday. My attention was drawn to how little the public generator - which has been blocked from pursuing wind and solar generation -receives for producing the majority of Ontario's electricity compared to other produces. The cost of private generators increased at double the rate of public generation. My belief is the only increasing accuracy with variable renewable energy sources (vRES) is in targeting marketing messages.